This guest post is from Natalie who runs a blog called Fluent Historian. 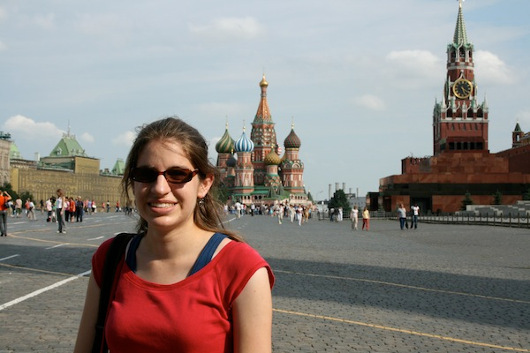 Natalie’s one of the most passionate bloggers I follow – she writes quite prolifically about Russian and Eastern European politics and literature, and is super well-informed about that part of the world. Today she’s sharing a bit about her experience learning Russian which you might find interesting and helpful. For one of the most comprehensive sites for learning spoken Russian, check this out as well. Also if you like to use music to help you learn Russian then listen to this. Whenever I tell people I speak fluent Russian, I usually get a lot of puzzled looks. In short, it happened like this: I read historical fiction about the Romanovs, the last royal family of Russia when I was young and developed a fascination with Russian history and the language. When I had the opportunity to study the Russian language after starting my studies at university I jumped on it. Even though Russian class was at nine in the morning every day (earlier than any of my friends’ classes), I loved it and got up every morning excited to go. I stuck with it and have achieved fluency in the language. If you are interested in learning the Russian language, the first thing to do to start learning the alphabet. Russian uses the Cyrillic alphabet which is completely different than the Latin alphabet used in English and many other Indo-European languages. The Russian variant of the Cyrillic alphabet has thirty-three letters. There are many good resources for learning the alphabet. I used Master Russian to teach myself during the summer before I started university. The best resources have recordings of what the letters are supposed to sound like. Having recordings by native speakers is very important as there are some sounds in Russian that do not occur in English. I would recommend spending time working on the alphabet in the beginning. A strong foundation will serve you well later in your studies. Even though it isn’t too hard to memorize the letters in order, actually being able to fluently read entire words and sentences with them takes some time. Remember how hard it was learning to read in English (or your native language)? It’s just like that in Russian. Luckily, learning to read as an adult learner, and therefore as someone who already is literate in another language, is easier than a child learning to read from scratch. Once you have the alphabet down, it’s time to start learning some words. I learned words in my class, but there are lists of common Russian words online. Master Russian has a decent list, as does Russian Pod. Learning some grammar is also important. Of course, everyone learns in different ways, but Russian grammar is very complex and the sooner you start learning it and assimilating it, the better. The good thing is, once you know Russian grammar, it will enable you to speak with a higher degree of accuracy when you encounter unfamiliar words. For example, all verbs in Russian have certain endings, and may follow a certain conjugation pattern, so knowing grammar will enable you to use new verbs correctly. We all have our strengths and weaknesses when it comes to language learning. Some people speak with beautiful accents almost immediately but struggle with grammar, and others are the opposite. In my case, I’m really good at grammar. I mastered most of the grammar of the Russian language by the end of first year. However, I had trouble remembering vocabulary and understanding the spoken language. I set out to correct this. For the first problem, I started using a spaced repetition system (SRS). Spaced repetition is a learning technique in which flash cards are reviewed at increasingly large intervals. The program I use is called Anki. Using Anki completely revolutionized the way I learn vocabulary. I input sentences I find in native material and periodically review these. Anki isn’t the only SRS program out there but it’s my personal favorite (and no, I haven’t been paid to say this—I just really love this program!). Anki works on Mac and Windows, but if you don’t like it, there are other programs out there. To improve my listening comprehension, I started doing just that: listening. I found radio stations with lots of talking and listened to those all the time. Even when I was doing my homework, I had the Russian radio on in the background. I didn’t understand anything at first but I kept listening. About a year after I started my daily listening, I found that I understood almost everything. Ultimately, you need to find what your weakness is and focus on practicing that. Ultimately, learning Russian hasn’t just given me some cool language skills (and mad bragging rights for mastering something as complex as Russian grammar). It has given me an entirely new culture to immerse myself in. I have read fantastic literature, talked to people who grew up halfway around the world from me, and learned about an entirely different world view. Sometimes, when people find out that I speak Russian and like foreign cultures and languages, they are puzzled when I say I am not a polyglot, nor do I wish to be one. I’m fluent in Russian and English, and occasionally somewhat competent in Ukrainian and Belarusian, but I don’t consider myself fluent in the latter two. The fact is, whenever I attempt to study another language, I always start to miss Russian. I think of all the Russian words I don’t know right now and how much I enjoy immersing myself in the language. I have fallen irrevocably in love with the Russian language. Don’t get me wrong, I respect polyglots greatly. But for me, Russian is the first and so far only language that I have truly loved. If you’re interested in learning Russian, or already learning and want some help, please don’t hesitate to contact me on on my website or on Twitter. I’m also considering writing a book for learners of the Russian language. Interested in this idea? Let me know below in the comments below! Natalie’s from the United States and she studied history and Russian as an undergraduate, before going to work in finance. In her spare time, she enjoys writing, reading, playing violin, and, of course, speaking Russian. You can follow her at her blog Fluent Historian. This was written by Natalie Keating. Did you find this interesting, useful or encouraging? A quick share on Facebook or Twitter will make my day! Thanks. Wow!~ Spasibo! I started learning Russian language from long back( 5yrs) and I am still like beginner. 5 yrs in the sense seems long but I hardly study in actual. Now I am bit more serious in learning Russian Language and your post gives me courage to learn Russian more. Once again Thank You! I will definitely follow your site and help me out. I have seen many Russian films and from there only my love to speak the language took its flight. Now, I am learning Russian and as you have already said that one should start with the alphabets so I have already started from it just as we study ABC for English, because these will only help in understanding the language. Yes, Slavic languages can be difficult for foreign people, but I think it makes them be interesting to learn. I must be lucky to speak both Russian and Ukrainian. Thank you for this great post. I enjoy reading your blog. You brought up a very useful suggestion to listen to the radio when learning language. As a matter of fact, this is the way I learned English when I came to America from Russia 40 years ago. I also found to be helpful to watch cartoons. When I learned few words and found their use while watching cartoons, I understood better where to use them. Thank you for your this great post. Hey, great post! I am also a big fan of learning grammar (especially if it is Russian) and Anki helped me pass a long lasting plateau. I also happy like being able to enjoy Russian culture. Russian literature is indeed fantastic, and not only the world-famous classics. There are many contemporary writers I adore: Улицкая, Токарева, Пелевин, etc. I feel myself very lucky to read them in the original. 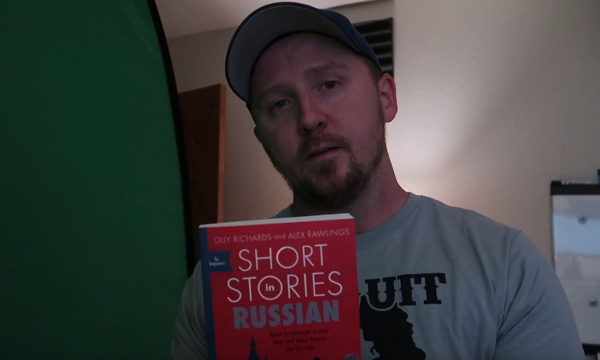 Throughout my adult life I have always wondered about learning russian. Only to dismiss the idea after one look at a sentence written in russian. Towards the end of 2017 I finally caved in and started. The reason was a word spoken in russian on TV. It was a really silly James Bond type of film where the hero (American of course) was ordering some very heavily armed russian soldiers to hand over their weapons and ammunition. They laughed and joked in russian about the American who wanted their “patrone” or ammunition. “Patrone” is also is one of the words used in Afrikaans (my first language) for rifle ammunition. That was it. Now I want to thank you for all the good advice. Yes, that alphabet is not so terrible after all. Wow, the other evening on TV with another silly movie I caught and understood, the word “pazelste” from one of the russian characters ( a crook of course). It felt like inheriting the universe. Maybe one day “Die Broers Karamazov” (The brothers Karamazov) will follow in russian. Interesting take on learning Russian and good points. Just recently, I’ve decided to pick up Russian again. I failed several times because I wanted to achieve too much in too little time. I also wanted to tackle the grammar too quickly. I do believe grammar is important and if you’re the type of person who likes to look for structure and patterns, it’s certainly helpful. However, this time I’m taking my time to “immerse” myself. I use tools like Pimsleur, Duolingo, Mondly (why does nobody ever mention it?) and an Assimil phrasebook to learn the basic essentials (e.g. colors, days of the week, numbers, greetings, basic verbs, etc.) while consulting a grammar book whenever I want to find out how the language works underneath. I’ll start “studying” using methods like Teach Yourself, Colloquial or others only when I feel sufficiently ready for it. 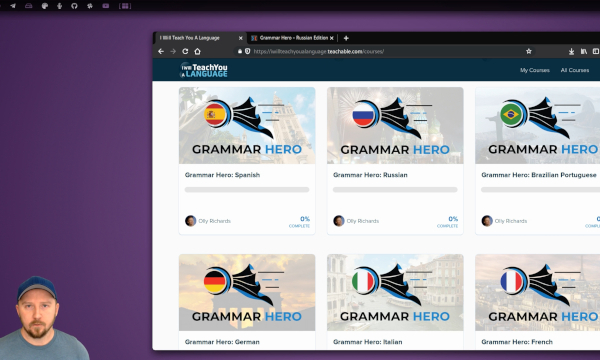 Language exchange sites are also very helpful in connecting with native speakers so you can start writing. I’ve found it very helpful to force myself to write – it makes you look up useful words or expressions you hadn’t thought of before. On a sidenote, my major focus is French in which I’m fluent AND proficient. I do, at times, feel like I’d better invest my time in further improving my French but then again, I can use it pretty much on a daily basis anyway so there are ways to deal with that. At some point, the language is so ingrained in your mind that it doesn’t really hurt learning a new language. However, if that’s a concern, perhaps it’s best to keep focusing on the language you really want/need to improve. One last point. I tend to think it’s probably a bad idea to learn a language that is closely related to a language you master or know well. Russian and French belong to two very different language families so it’s hard to confuse them. Italian or Spanish, on the other hand, well, I’ve found that learning those “hurts” my French despite my proficiency in the language. So I prefer to stay away from them as long as there’s no need to know those languages. Maybe we could help each other somehow?